Did you know that a recent study by the Annals of Rheumatic Diseases found that 10% of the world’s population have lower back pain? This places it first in causes of disability. Dealing with pain in your lower back is, well, painful. One common source is sciatic nerve pain. There are many causes of sciatica, but the symptoms are all largely the same. This is because sciatica is caused by the inflammation of the sciatic nerve. 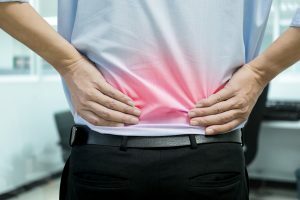 Depending on the severity of your sciatica, different lower back pain treatment approaches may be used. NSAIDs, or non-steroidal anti-inflammatory drugs, such as aspirin or ibuprofen, are useful for pain relief involving flare-ups in less severe cases. For more nagging cases, the temporary use of prescribed muscle relaxants or narcotics may be considered. Hot and cold compressions with an ice pack or heating pad can be an excellent temporary relief. Another topical solution that can help is transcutaneous electrical nerve stimulation or TENS. This is essentially a portable low voltage shocking device that has proved especially effective at treating muscle-related pain. Steroids injected into the epidural space can reduce or remove the inflammation that was causing the pain for a few weeks. This might be all the time your back needs to heal, but the pain could return. Couple any of these treatment approaches with chiropractic care, physical therapy, and exercise on your own time, and pain will likely ease up or diminish entirely in one to three months. This isn’t always the case, so for recurring sciatic nerve pain, there are surgical options to explore as well. The worst thing you can do for back pain is nothing. Suffering in silence without seeking the advice of a medical professional, like 37% of Americans do when experiencing lower back pain, isn’t fair to yourself. There are programs and treatments that will at worst help you cope, and at best will heal your back entirely. Don’t hesitate to seek out treatment today.